Sorry for the confusion today. The regular charts are now posted. NETWORK FINALS: SURVIVOR and the 9:30PM BLACK-ISH rose 0.1 in final numbers. CABLE HIGHLIGHTS: TNT’s NBA PLAYOFFS games topped Wednesday cable, but the Chicago vs. Boston game (1.76) was far higher than Atlanta vs. Washington (0.73). NBC Sports Net’s coverage of the NHL PLAYOFFS was not up to basketball at 0.40/0.26. VH1’s BLACK INK CREW rose 0.08 to 0.72. On Bravo, REAL HOUSEWIVES OF NYC slipped 0.02 to 0.46. OWN’s GREENLEAF ticked up to 0.35. On HGTV, PROPERTY BROS climbed 0.06 to 0.35, HOUSE HUNTERS ticked down to 0.34, and HOUSE HUNTERS INTL ticked up to 0.34. On TLC, MY 600-LB LIFE lost 0.09 to 0.35. and THIS IS LIFE was at 0.26. In the news wars, MSNBC’s RACHEL MADDOW SHOW had a clear demo win with 0.34, compared to 0.28 for both Fox News’s THE FIVE and TUCKER CARLSON TONIGHT, but as usual Fox News won in the older Total Viewers metric. On ID, SEE NO EVIL gained 0.05 to 0.32, and REASONABLE DOUBT was also at 0.32. FX’s FARGO fell 0.08 from last week’s season premiere to 0.32. Lifetime’s LITTLE WOMEN ATLANTA dropped 0.05 to 0.31, and LITTLE WOMEN DALLAS was down 0.08 to 0.29. On Discovery, THE LAST ALASKANS was at 0.31. FXX’s ARCHER slipped 0.02 to 0.26. On MTV, CATFISH dropped 0.08 to 0.26, and ARE YOU THE ONE. E!’s TOTAL DIVAS ticked down to 0.25. 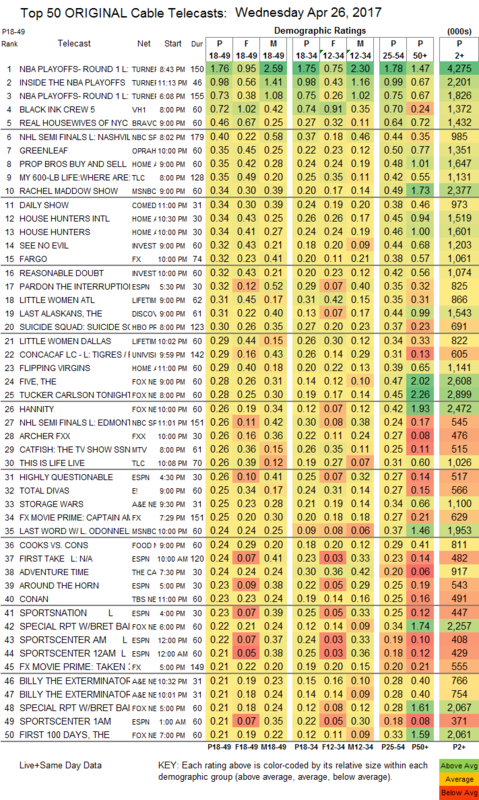 On A&E, STORAGE WARS was at 0.25/0.20, compared to last week’s 0.26/0.24, and BILLY THE EXTERMINATOR was at 0.21/0.21, compared to last week’s 0.21/0.20. Food Network’s COOKS VS CONS was steady at 0.24. WGNAmerica’s UNDERGROUND fell 0.05 to 0.14. Comedy Central’s COMEDY JAM dropped 0.02 to 0.11. IFC’s BROCKMIRE lost 0.03 to 0.08. 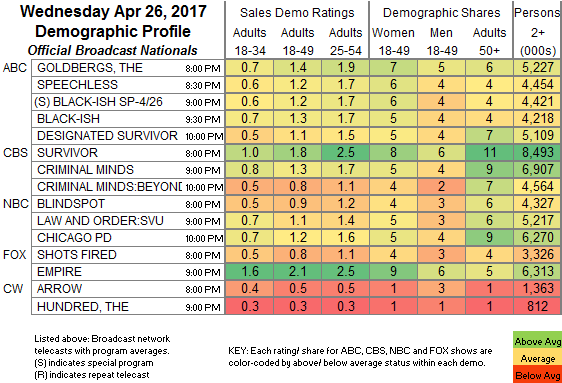 On TV Land, LOPEZ held at 0.07, and NOBODIES remained off the chart, down 0.01 to 0.05/320K. POP’s comedies were also chart-less, HOLLYWOOD DARLINGS up a tick to 0.04/147K, and RETURN OF THE MAC practically nonexistent, down 0.02 to 0.01/47K.